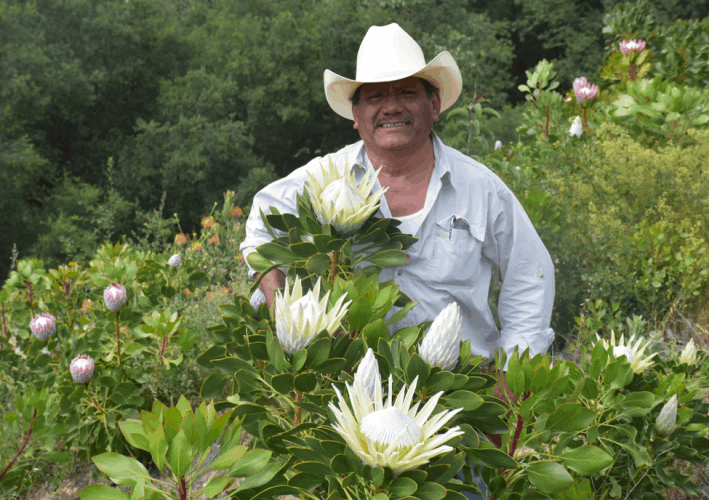 Meet Mel of Resendiz Brothers Protea Growers llc., a Southern California protea farmer who has a passion for growing exotic flowers. We caught up with him to discuss all things protea! Mel: I was cutting flowers and grafting proteas. Specifically, we were grafting our white sugar bush flowers. It’s a beautiful summer flower. Mel: I like to work with flowers and I like to work for myself. I enjoy being in the fields taking care of my plants. Mel: We give presentations to garden clubs and the local horticulture society. We donate flowers to the local high schools and I teach farmers how to grow proteas. I am also the president of the California Proteas Association, the secretary of the International Proteas Association, and I am a member of the San Diego County Farm Bureau. Mel: My journey started almost 37 years ago. I started working for Zorro Protea Farms. They hired me for a month, then three months, then three years! In1987, they made me the foreman of the company and eventually they made me the farm manager. I worked there for 20 years. In 1999, the company sold their land to developers. I kept working with the local growers, selling flowers to florists, and meeting customers. Eventually, my family and I established Resendiz Brothers Protea Growers LLC. We are now the largest supplier to South Africa and Australia. We also ship over 200 varieties of our flowers throughout the US and Canada. CA GROWN: What is your hobby or pastime when you are not farming? Mel: I never stop farming! I enjoy creating new varieties of protea through cross-pollination and often drive around the property to see if we need anything. During my spare time, I enjoy watching soccer. Mel: If they are interested in becoming a flower farmer, they should talk to the wholesaler to see what flowers are in demand and needed. I would also go to a few suppliers to get information about the new varieties of flowers being grown. You don’t want to plant what is already available, you want to become a new grower who plants something that is needed.